Jeep Compass Trailhawk First Drive: Trail Rated! Jeep Compass Trailhawk with diesel engine and automatic gearbox driven. The Jeep Compass won the 2018 NDTV Car Of The Year for good reason. 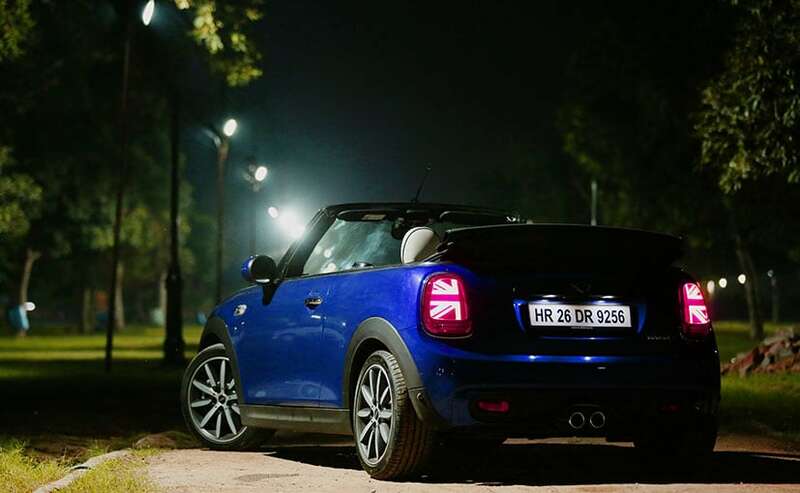 It is priced well, drives considerably nicer than almost everything else in its segment and is built well too. 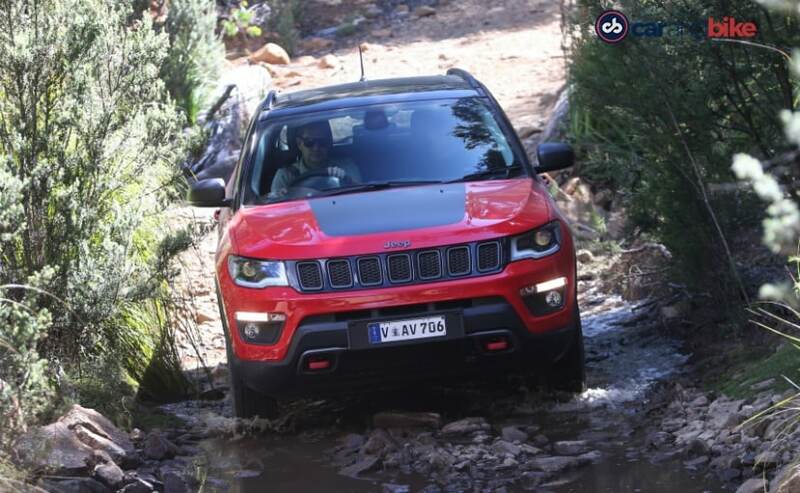 The Jeep Compass also throws in four-wheel-drive in the top spec models for those who want to do some light off roading or atleast have the option to do so. And with over 10000 units sold in just the first few months, you probably have seen a fair few of them on the roads too. But as with everything in the world, evolution is key. And that is why Jeep will now be offering an even more competent variant in the range – the Trailhawk. And yes, it could make it to India with a diesel engine + automatic gearbox combination. 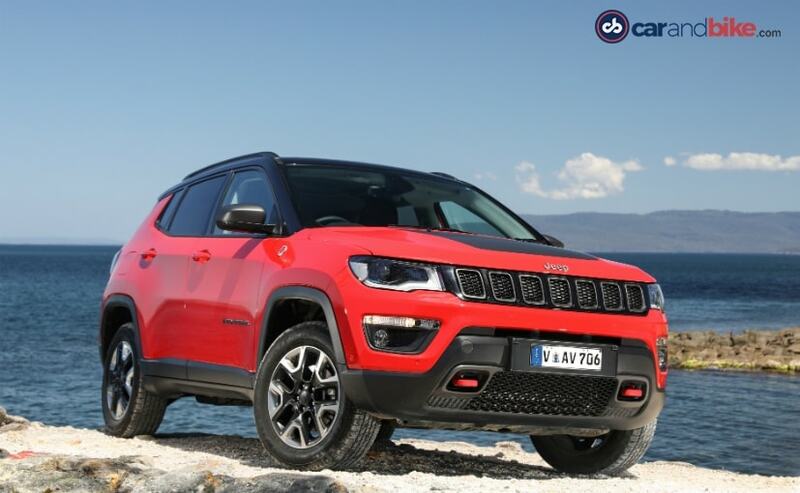 While the standard Jeep Compass looks really cool, the Trailhawk is the bees-knees! For starters, all the glitzy chrome bits that the standard Compass (in top of the line Limited trim) gets has been replaced by a more purposeful looking satin metallic black. 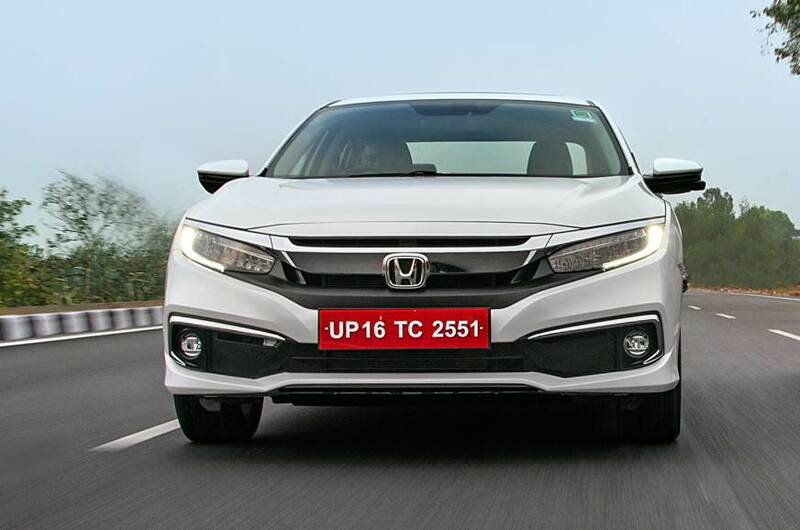 This includes the chrome on the front grille and the accent piece on the side that runs from the a-pillar all the way across the edge of the roof and on towards the bootlid. The Jeep Compass Trailhawk also gets a set of blacked out Jeep badges with red accents and a large ‘Trailhawk’ badge on the bootlid. More prominent changes include the signature black vinyl sticker on the bonnet and the prominent tow hooks inbuilt into the bumpers. The tow hooks too have been painted red to match the black and red theme that all Trailhawk models get. And while the front bumper gets a dual tow hook setup, the rear gets just one. You also get the prestigious ‘Trail Rated’ badges on the front fenders and a new set of 17-inch Trailhawk exclusive two tone (black and silver) alloy wheels that complete the look. And all these smaller details make the Jeep Compass look even more purposeful and even more aggressive than it already is. The black and red theme continues on the insides too. 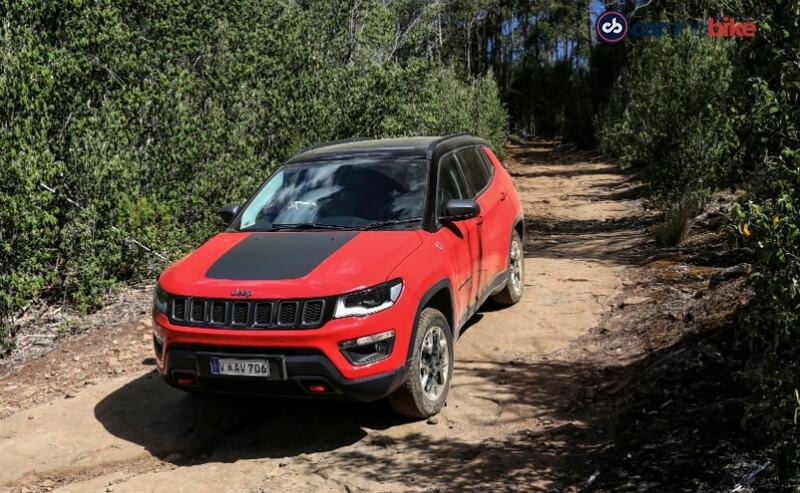 The Jeep Compass Trailhawk will finally be the variant that gets an all-black leather interior as compared to the white one that the other models get in India. And the black seats have been peppered with some lovely red stitching and an embroidered Trailhawk badge. 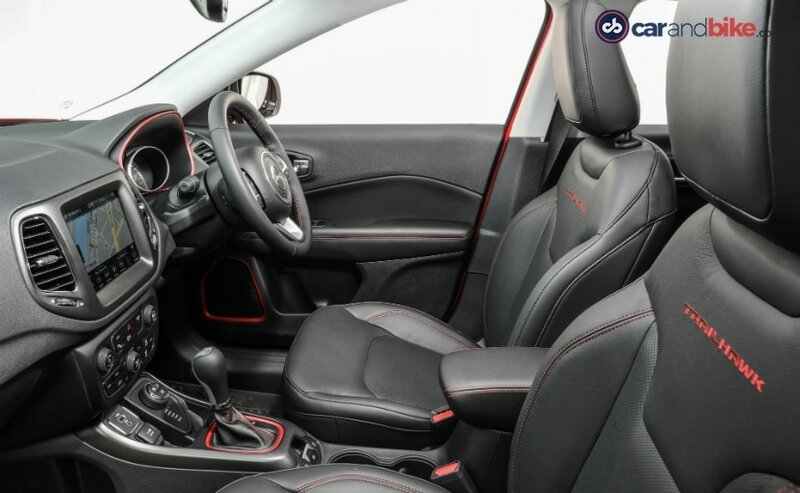 The gear console, instrument cluster and door panels all get red accent outlining too – all of which makes the Compass Trailhawk’s cabin a great place to be in. The top notch build quality of everything continues of course. Other features remain the same. 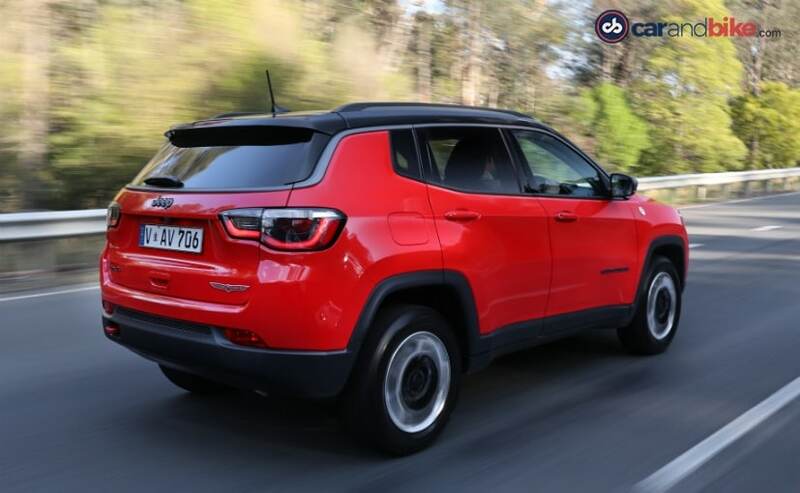 The Compass Trailhawk will continue to get the likes of a touchscreen infotainment system that comes equipped with Apple CarPlay and Android Auto. The Australian spec version that we drove also had a panoramic sunroof option added in, which even though is an expensive add-on, makes the Compass a lot more attractive as a package. Now while the final spec of the Indian version has not been locked in just yet, assuming that the Indian car will get the sunroof too is jumping the queue. That said, considering the fact that even the Australian Compass (and all other right hand drive versions) are built in India, we do hope we get it here too. 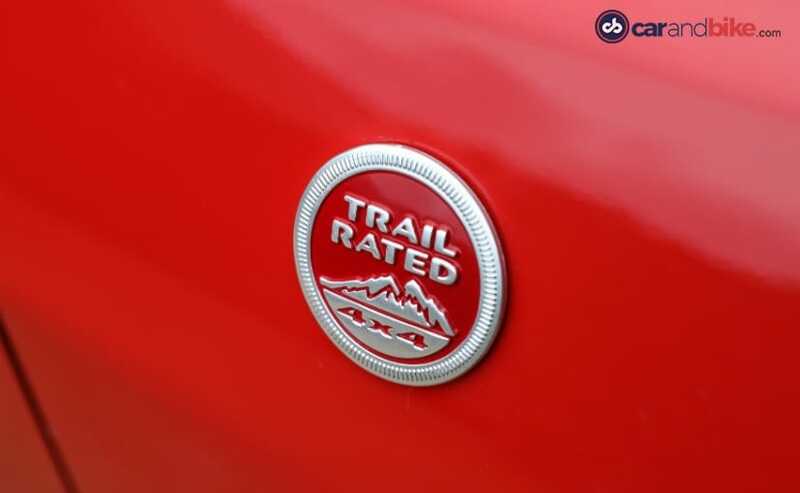 Ok then, lets get to the part that really makes the Jeep Compass Trailhawk deserve those ‘Trail Rated’ badges. The Trailhawk is essentially the off-road ready variant in any Jeep model range and gets some much needed bits and pieces that you need to make sure the SUV can handle all that extra abuse. 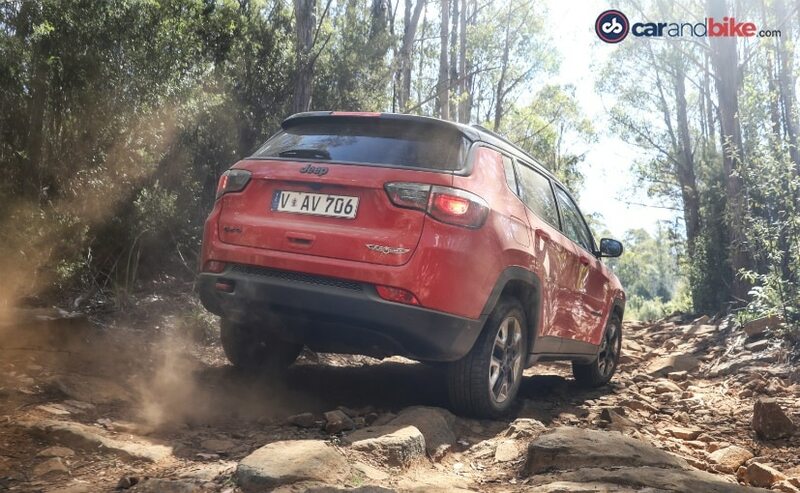 The Compass Trailhawk therefore gets additional under body protection for the engine, transmission and the differential with add-on skid plates that protect it from rocks or any other stray obstacles you drive over. The Trailhawk also gets a different suspension setup with heavy duty shock absorbers that offer more articulation and a much needed 20mm extra ground clearance. Apart from that, the Trailhawk also comes factory equipped with better all-terrain tyres that can handle difficult terrain without much damage. The other big addition – and now this is where the mechanical changes do matter – between the standard car and the Trailhawk is the ‘four-wheel-drive low range’ mode. While the standard car only gets a four-wheel-drive lock mode (essentially 4wd-high in off-road parlance), the Trailhawk’s additional low ratio mode helps with tractability while off road making it easier to cross obstacles while making sure the engine isn’t very stressed. The low range is particularly helpful while trying to crawl over a set of rocks or general rocky terrain in particular. 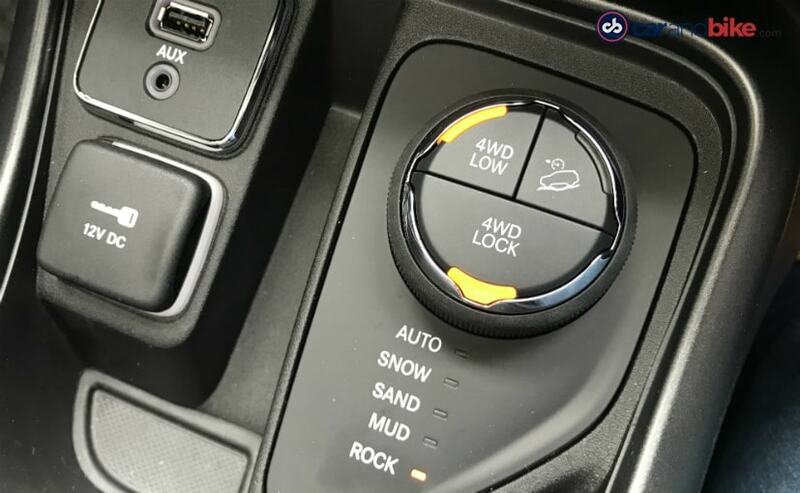 And to help with the rock crawling even more, the Compass Trailhawk gets an additional Rock mode in Jeep’s Selec-Terrain Traction Management System that can be accessed on the move by turning the knob on the central console. This of course is in addition to the Sand, Snow and Mud modes that the standard car already gets. The Compass Trailhawk also gets hill hold mode and an additional hill decent system which can be very useful while coming down steep slopes with minimal traction. All in all, the Compass Trailhawk then is a very potent weapon off road considering the fact that it sill have very good on-road manners. And talking about on-road manners, lets talk about the engine that will power the Trailhawk first. 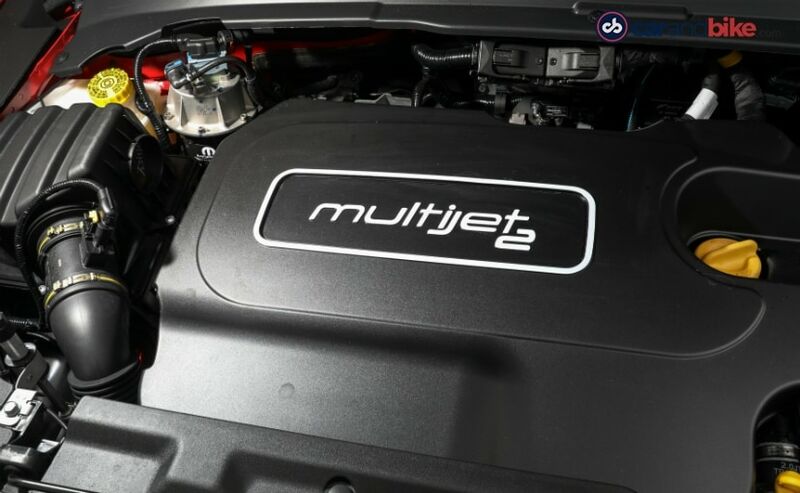 The Jeep Compass Trailhawk will in fact come with the same 2-litre multijet diesel engine that does duty in the standard Compass. The 4-cylinder, turbocharged diesel engine makes 168 bhp and 360 Nm of peak torque and as we already know, the motor is quite responsive and fun to drive especially with a manual gearbox. That said, the Trailhawk will most likely not be equipped with a manual gearbox but a more user friendly automatic instead. Sadly though, it will not be the 6-speed dual clutch gearbox used on the petrol model. 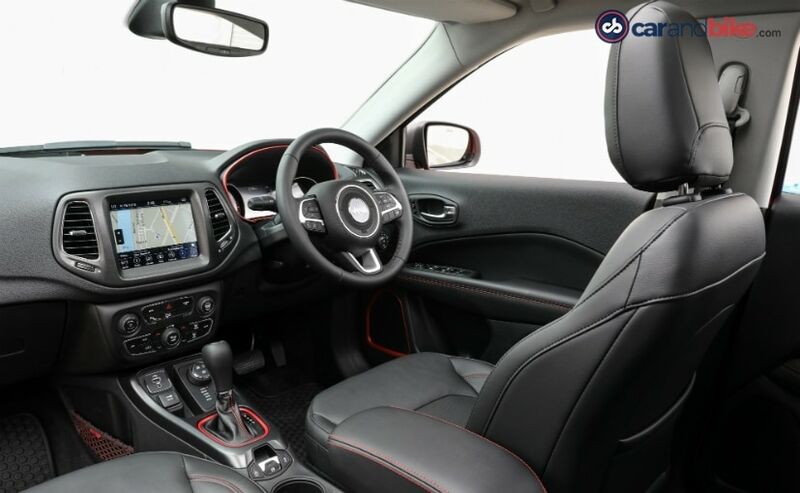 Instead, the Jeep Compass Trailhawk (in Australia Spec) gets a conventional torque convertor 9-speed automatic gearbox that has been sourced from gearbox experts ZF. And while the torque convertor works perfectly well off-road at slow speeds and in precise throttle-feathering conditions, it is a bit underwhelming on the road. It is by no means a bad gearbox though. It does do its job rather well – albeit a bit slow (especially under kickdown) – and it does cruise exceptionally well with the 9-speeds. On the highway in particular, especially while covering great distances, this will make everyone’s job much much easier. And in the city too. 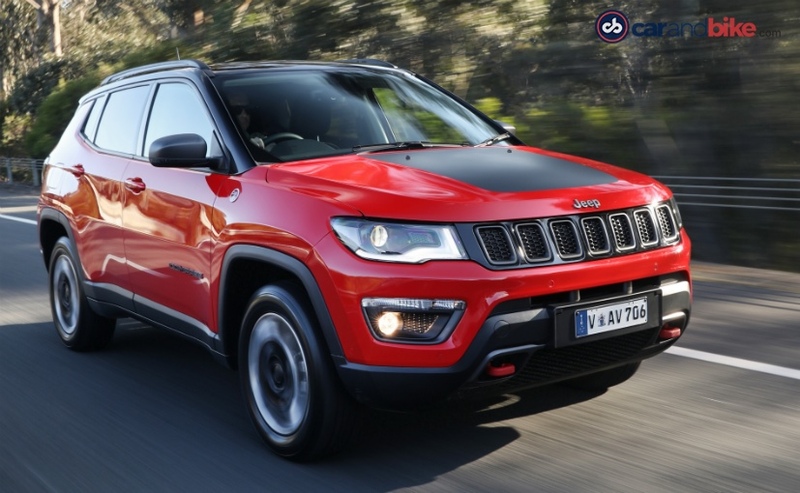 The Jeep Compass is by no means a small car and the automatic gearbox will go a long way to ensure that it makes the job of driving in start stop traffic a lot easier. But, it just isn’t as quick or as responsive as a modern dual clutch from say the Volkswagen Group is. The Australian spec Jeep Compass is also very different from the Indian version in the way the suspension and steering geometry is set up. While the Indian version has a very precise and a heavier steering feel, the Australian car does feel slightly softer and delayed in terms of feedback. The positive there is of course, the lighter steering does make it easier to drive in the city. The ride quality too is slightly softer and there is considerably more body roll too. While the Indian Compass actually puts the ‘sport’ in the SUV, the Australian one did feel slightly more tamed. To wrap is all up, the Jeep Compass Trailhawk (and the automatic version in general) will bring a whole bunch of new customer to the already very popular SUV. The Compas Trailhawk as with every other market, will be the top spec variant in India and will be priced aggressively at an estimated price point of about Rs 23 lakh (ex-showroom). And Jeep will launch the variant in India this year! Competition will include the likes of the Hyundai Tucson and even the higher priced Volkswagen Tiguan. 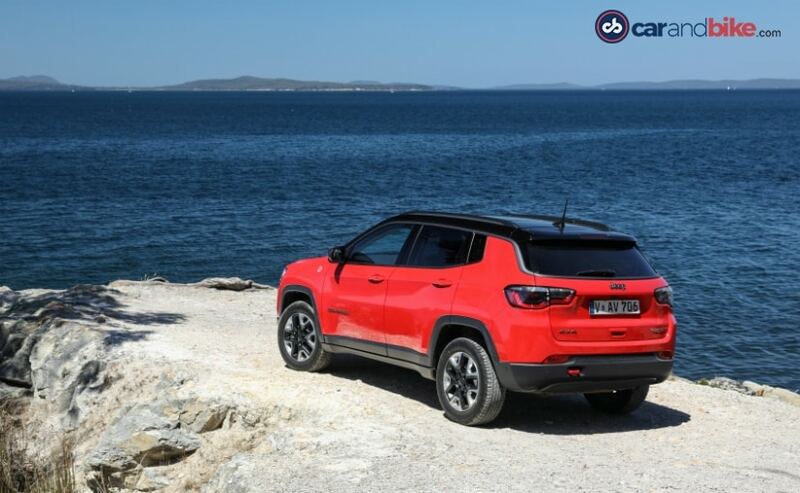 While the Compass already offers the ‘Jeep Lifestyle’ at an affordable price point, we think the Trailhawk’ in particular will offer even more making it quite popular – especially with the urban buyer who has ached for the diesel Compass + automatic gearbox combination.